When Dawn Johnson got the news, she couldn’t help it. She started crying. 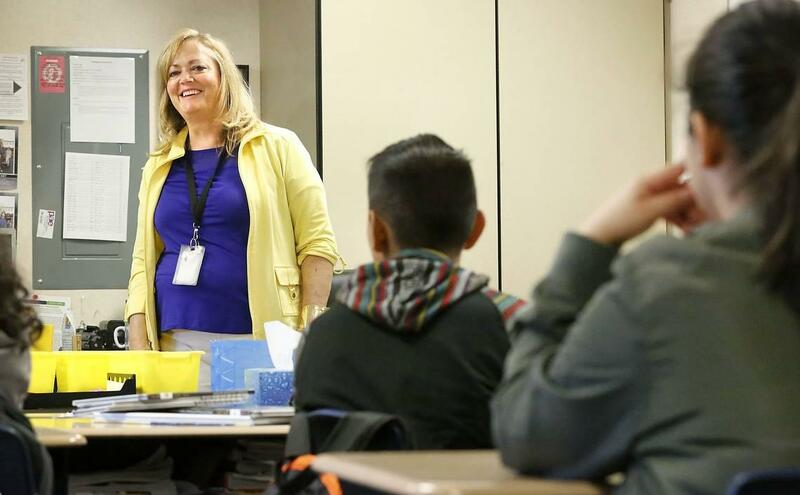 She was in the middle of class – she teaches sixth grade math and history at Rowena Chess Elementary School in Pasco – and tears began to fall. Her students weren’t worried, though. “We knew she was crying because she was happy. Really happy,” said Alfredo Sanchez, 12. “We started clapping for her,” added Tony Aguilar, 11. Johnson, 56, has a kidney condition and needs a transplant. And she learned earlier this month that she’ll get one – thanks to her good friend Mary Frances Lembo, who’ll be the donor. Johnson and Lembo believed for months that they weren’t a direct match, so Lembo had agreed to go forward with what’s called a “paired donation” – something that would give Johnson a better shot at finding a suitable kidney. In that kind of donation, non-matching pairs are linked with other non-matching pairs or become part of a larger donation chain. But then further tests revealed the two women actually are matches – Johnson has type O blood and Lembo has a sub-type of A that will allow her to donate to her friend. Word came in the form of a phone call earlier this month. The transplant will happen in June in Seattle. It’ll mean relief for Johnson, who has focal segmental glomerulosclerosis, a rare disease that affects the kidney’s filtering units. Johnson has the secondary form, caused – in her case – by a genetic defect. She was born with only one kidney. Johnson has been on dialysis since last summer. While she’s finishing out the school year and preparing for her life-changing surgery, Lembo also is getting ready. She used to live in the Tri-Cities, but moved to Michigan a while back. She’ll fly to Seattle, where she expects to spend about two weeks recovering from the surgery. She has family in the area to help. She also has Johnson’s eternal gratitude. Lembo “is giving me such an incredible gift. I am almost overwhelmed with gratitude. I mean, how can you possibly say thank you for a gift that gives you back your independence and improves your quality of life so dramatically?” said Johnson, who lives with her husband, Tim, in Richland. Lembo, 55, who works remotely for Pacific Northwest National Laboratory, is quick to deflect praise. She first thought about being a living donor when a neighbor girl in Michigan needed a transplant. She was tested, but didn’t match. Then she learned of Johnson’s situation. “When you think of my 6 to 8 months before I’m back to normal again, compared to Dawn being able to live a normal life – I think it’s a good (tradeoff),” she said. It’s not one a lot of people make. Most organ donations come from deceased donors, even though the vast majority of people on the transplant waiting list are in need of kidneys and livers, which can come from living donors like Lembo. In all, about 115,000 people in the U.S. currently are waiting for a lifesaving organ transplant. Johnson and Lembo met years ago and bonded through walks with their dogs and horseback riding. They stayed connected when Lembo and her husband, John Tindall, moved to Michigan. Lembo said she’s a little nervous about the surgery, but mostly she’s excited to help her friend. Johnson – who plans to be back at Chess in the fall – is excited, too. She’ll spend months recovering and will have to take medication for the rest of her life. Published: May 28, 2018, 8:37 a.m.